It's okay to lay low and avoid the brunch if you tell your loved ones what you need to get through the day. Take care of yourself first. 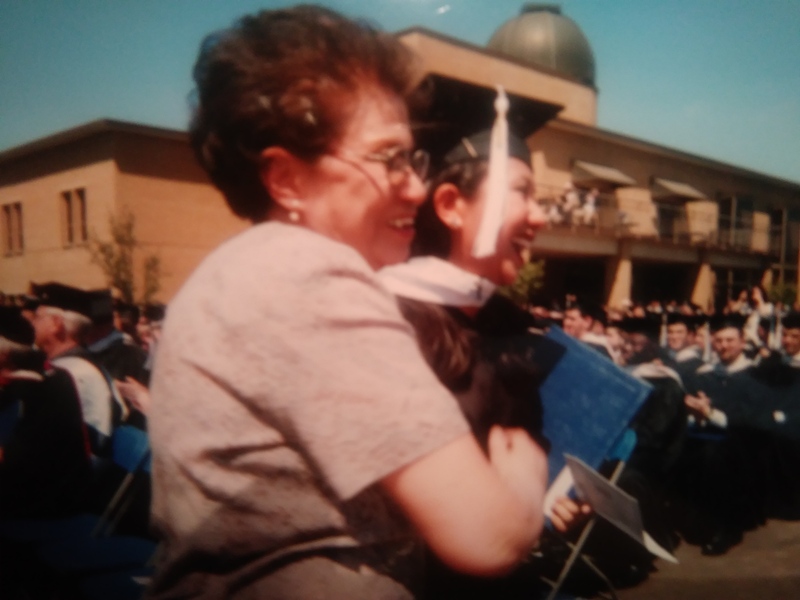 The author is pictured with her mother on college graduation day which fell on the same day as Mother's Day. She died suddenly and unexpectedly of heart failure twelve years ago, and it shocked everyone around us with much grief and tragic loss. I couldn’t even write that first sentence without feeling a lump in my throat, and revisiting those painful memories bring out raw emotions that I would much rather bury and suppress. I have unsuccessfully tried to squash it so much that I could barely stand to look at pictures of her for years after her death. But now my need to heal outweighs my need to avoid the pain. It’s the kind of violent pain that hurts beyond the physical aspects of human pain; the kind of pain in which bodily pain is numbed because the only thing I felt was the impact of her death. That pain is mixed with extreme fear, confusion, loneliness, and longing. Anger, guilt, and regret are thrown into the mix as well. That pain has been constant for twelve years, and it has crippled my ability to make some hard decisions. It’s time for me to heal. Healing unresolved wounds will free myself from layers of baggage which have manifested in my body, and I just need to let that go. Society values intellect over emotion, so crying about my mother twelve years after her death can make others uncomfortable. I even question myself from time to time when I cry out for my mom. Am I crazy?! Why do I keep saying, ‘Mom, help me, please,’ like a helpless little girl? She’s gone, Pia. Get ahold of yourself. Everyone’s tired of you talking about your mom and seeing you cry. But the truth is, grief is like that. It just has to come out. Sudden explosions of emotions without warning overtake you at inappropriate times – maybe even at work. Once, when I was talking to a colleague about something that reminded me of my mother, I burst into tears and had to rush out of the room to hide in the bathroom because I was doing the “ugly cry” sobbing and gulping and slobbering all over. Every year on Mother’s Day, I really never know how it’s going to be for me. Some years, I could do the whole shebang: the brunch, the pictures, and the family gatherings. Then there are some years when it’s a big flat-out NOPE. Do not feel pressured to do what others want you to do: If you want to skip the brunch, the pictures, and the family gatherings, by all means, SKIP IT! You don’t owe anyone an explanation. Take care of you. If you have your own children and they want to celebrate you, tell them what you want: “Hey kids, I would like to eat my snacks in bed and watch reruns of Parks and Recreation. You cool with that?” I’m pretty sure they would be fine with it. Take care of you: I know I already said it, but I can’t say it enough because I forget this so many times. I have to be kind to myself because my raw emotions can be exhausting. A guilt-free afternoon nap can be rejuvenating if you aren’t feeling like your best self. Talking and writing about my favorite memories of her: There are so many of them! I like to think that I keep her legacy alive with her little Filipino sayings that made me laugh. My children know those sayings, and those are little inside jokes we share together.